Often when doing research for the restaurant or website, I will find a back-story on a brand that I think is interesting and I’ll have to do a bit more research to do the story justice when talking to my guests. Larceny very well may have the most interesting of those stories. First, let’s take a refresher law course. Larceny, in a legal sense, is “the wrongful acquisition of the personal property of another person,” or in layman’s terms: stealing. 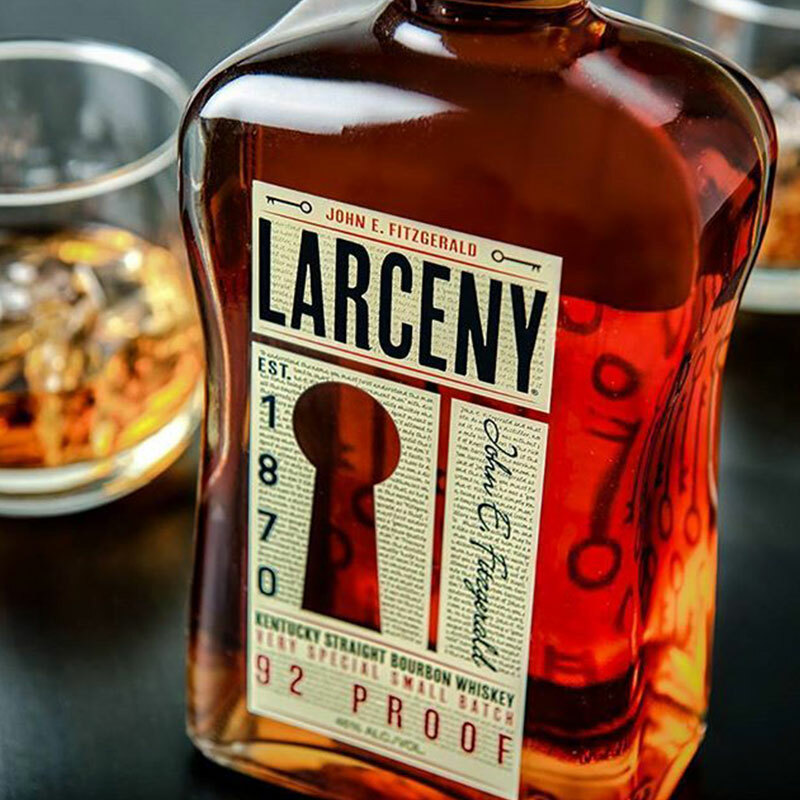 When you look at the bottle that Larceny bourbon is sold in, there are many keys and a keyhole. Above the name, you see the name “John E. Fitzgerald.” If you take the logical route, you would assume that Mr. Fitzgerald is a distiller, and this product bears his name because he was involved in some way. That’s what John would want you to think. Now that you have the backstory behind the name and the label on the bottle, we can start talking about what is inside. The small grain in this bourbon is wheat, so in theory, it shouldn’t be too spicy.. but that is where I had to throw every pre-conception I had about this bourbon out the window. Although this whiskey is wheated and a relatively cool 92 proof, I was immediately stunned by the spice flavors. I had to reach for the water and use a bit to tame the stuff before I could really pinpoint what I was tasting. This is a spicy, oaky bourbon that defies expectations. This is an interesting one, so I would recommend you try it in a bar before picking up a bottle. Learn how we grade our bourbon whiskeys. I keep a bottle of Larceny Bourbon on the shelf to entertain guests, and for easy drinking. This isn’t an overly impressive bourbon, but good enough to be enjoyed regardless of the occasion. The typical price of a fifth in our area is about $25, so having a bottle of your own shouldn’t set you back too far. If you are really feeling frisky, try this recipe specifically designed for Larceny bourbon. Combine ingredients into a shaker and shake, pour into a stemmed cocktail glass, no garnish. Yea, its that easy! If you have tried Larceny Bourbon, let us know what you think! Leave a grade below and be sure to subscribe to keep up with all our latest reviews! I love Larceny! Had to order from a distributor in NY as not carried in our area. Trust me we searched VA, DC, MD and PA before I ordered. There’s plenty in our area of VA. The Va ABC does carry it. If the local store does not have it, just ask. I love Larceny and find it becoming my go to regular bourbon. I think it has a very similar taste profile to Maker’s, but at a much cheaper price. I do a Blind Taste Test twice a year with my buddies. Each time, Larceny falls into my Top 3.